As far as Jimmy King can recall, it has happened only one time. The Fab Five, the Michigan basketball sensation who spent their first two years of college in 1992 and 1993 attached at the hip reaching NCAA title games and changing parts of the basketball culture, have reunited once as a unit. King recalled a Jalen Rose 2003 charity game in Chicago as the only time all the members of the Fab Five — King, Rose, Ray Jackson, Juwan Howard and Chris Webber — had reunited since their era ended at U-M in 1995. When Rose, King and Jackson were honored at halftime of the Michigan/Gardner-Webb game today — brought together as part of the Legends Classic — it showed another step toward the group’s reconnection with the university. The trio were given navy blue Michigan jackets and honorary plaques. But, as with most of the past 15 years since the Ed Martin booster scandal became public, involving Webber, there was a large piece missing. Howard is playing with the Miami Heat, so his absence was understandable. But the reason all five haven’t reunited at Crisler Arena, the reason their NCAA Final Four banners are hidden away, is because of Webber and the NCAA violations associated with his time in the program. According to the NCAA investigation that concluded in 2003, he and three later Wolverines (Robert Traylor, Maurice Taylor and Louis Bullock) accepted money from Martin. Part of their punishment is no connection with the university for 10 years from the May 2003 final NCAA report. Yet that’s where the excitement begins for fans. Rose and King said they have talked with athletic director Dave Brandon and coach John Beilein about eventually welcoming the whole group and era back. They said more specific discussions could start early in 2012. The five players also are participating in interviews for an ESPN Fab Five documentary scheduled to air in the spring. King is a regular at Crisler, having broadcast games in recent years, and Rose makes occasional appearances, including having a Crisler day in his honor a few years ago for his charitable work. But this was just Jackson’s second visit to the arena since leaving in 1995 — his first in more than a decade. 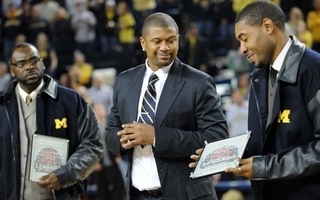 ANN ARBOR, Mich.(AP) — Three-fifths of Michigan’s Fab Five — Jalen Rose, Jimmy King and Ray Jackson — were honored by the school in what was a bittersweet ceremony for them Sunday at halftime against Gardner-Webb. The Final Four banners they earned as freshmen and sophomores have been removed from Crisler Arena and the NCAA still forbids the school from associating with Chris Webber because of a booster scandal. The NCAA forced the school seven years ago to dissociate from Webber and three non-Fab Five players until 2013. A federal investigation revealed that now-deceased booster Ed Martin gave Webber, Maurice Taylor, Robert Traylor and Louis Bullock more than $600,000 while they were student-athletes. E-mails seeking comment about Sunday’s ceremony were sent to Webber. Juwan Howard, the fifth member of the Fab Five, plays for the Miami Heat and said Friday he didn’t know about Sunday’s ceremony. The Fab Five’s tangible accomplishments are rolled up, wrapped in plastic and tucked away in the basement of a library on campus because of one of the school’s self-imposed sanctions. Webber has said the Fab Five won’t ever leave the public consciousness. “You can’t think of Michigan without thinking of us,” Webber said in a 2007 interview with The Associated Press. The Fab Five set trends with fashion and grabbed attention with a brash style of play not seen before. They captivated younger generations of fans – and disturbed some older ones – by strutting, shouting and slamming like they were on a playground, not playing before thousands in arenas and millions on TV. Instead of using the Fab Five’s legacy to boost its basketball program, Michigan has awkwardly avoided the tarnished era that led to what the school president called a “day of great shame,” on Nov. 2, 2002, when self-imposed sanctions were announced. Michigan athletic director Dave Brandon said eventually, he hopes, that will change and Webber will be welcomed back.